Car interiors could morph into different configurations at the flick of a switch, using 3D-printed inflatable structures developed by researchers at the MIT. The Self-Assembly Lab at Massachusetts Institute of Technology (MIT) worked with BMW on the project, called Liquid Printed Pneumatics. The German auto brand wanted to see how the lab’s experimental engineering techniques could help it realise some of the shapeshifting features imagined in its futuristic concept cars. The result is a stretchy, inflatable silicone prototype that can take on a number of different shapes depending on the level of air pressure inside. If turned into a car seat, it could quickly be tuned to different positions, or levels of springiness depending on user preference. Potentially, the same technology could help to create a more dynamic interior, where seats sink away when not needed, or the dashboard can change shape. This is of interest to automakers because if cars go fully autonomous, it could free up space for passengers to enjoy a range of activities while they travel. “The outcome of this collaboration manifests that a new material future is imminent,” she continued. 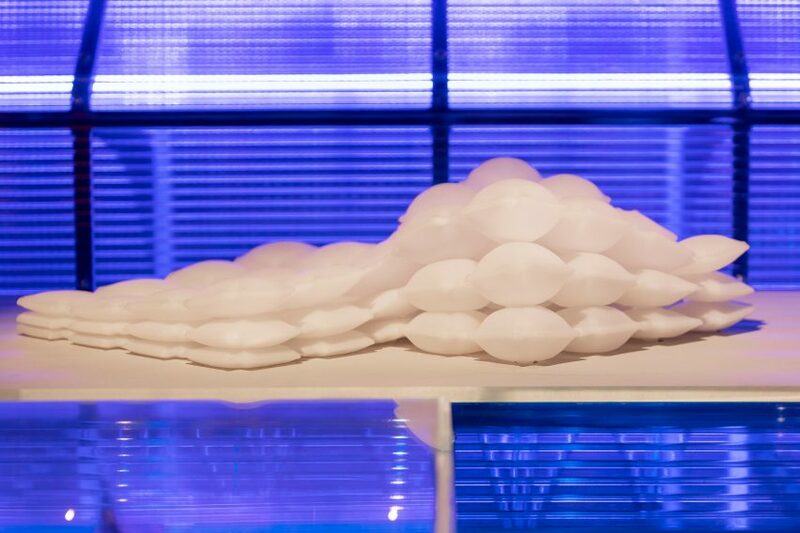 The project marks the first time an inflatable object has been 3D-printed, with traditional inflatable production methods unable to yield a design this complex. 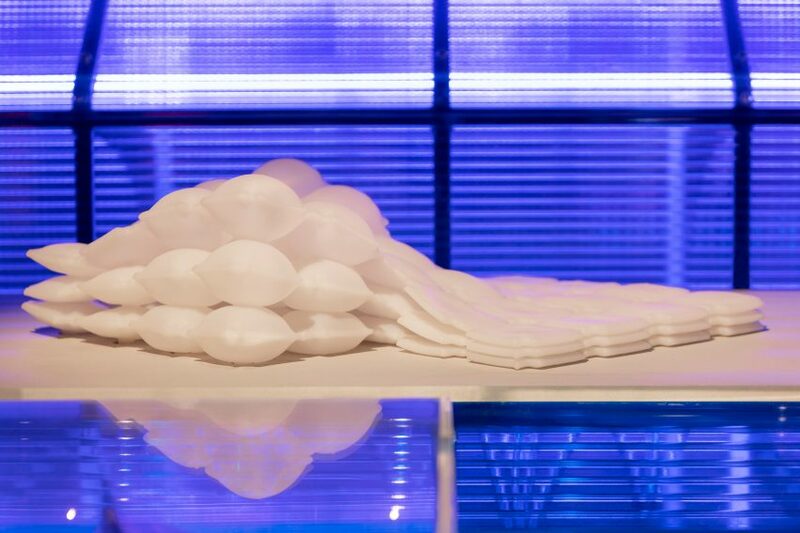 The inflatable was made using the Self-Assembly Lab’s Rapid Liquid Printing technique, which was first unveiled last year as a way of printing furniture and other objects. The technique involves extruding material from a computer-controlled nozzle into a tank of gel, where its left to harden. 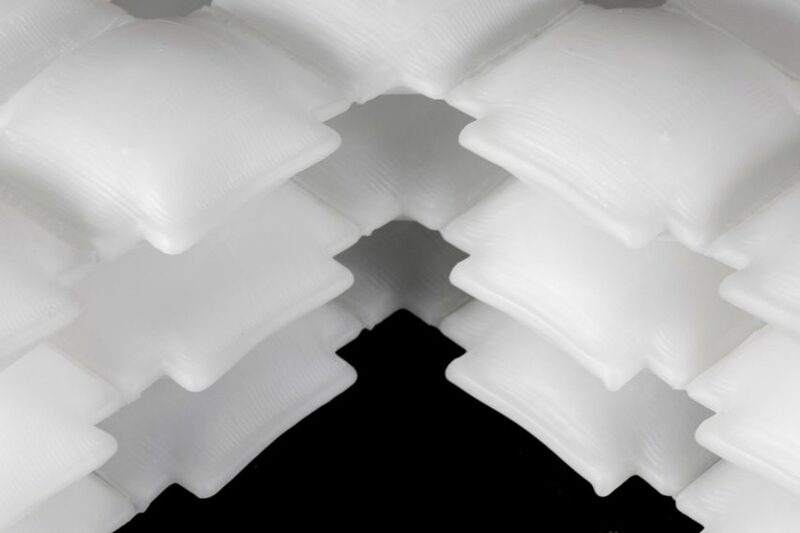 This allows for the use of softer materials that in other forms of 3D printing would collapse under the weight of gravity before they are set. The process is also fast, meaning it opens up possibilities for mass manufacture in a way that traditional 3D printing doesn’t. “Rapid Liquid Printing combines the advantages of casting with the customisation and capabilities of 3D-printing and demonstrates the first printed inflatables that can fully stretch and transform like balloons,” Self-Assembly Lab head Skylar Tibbits told Dezeen. 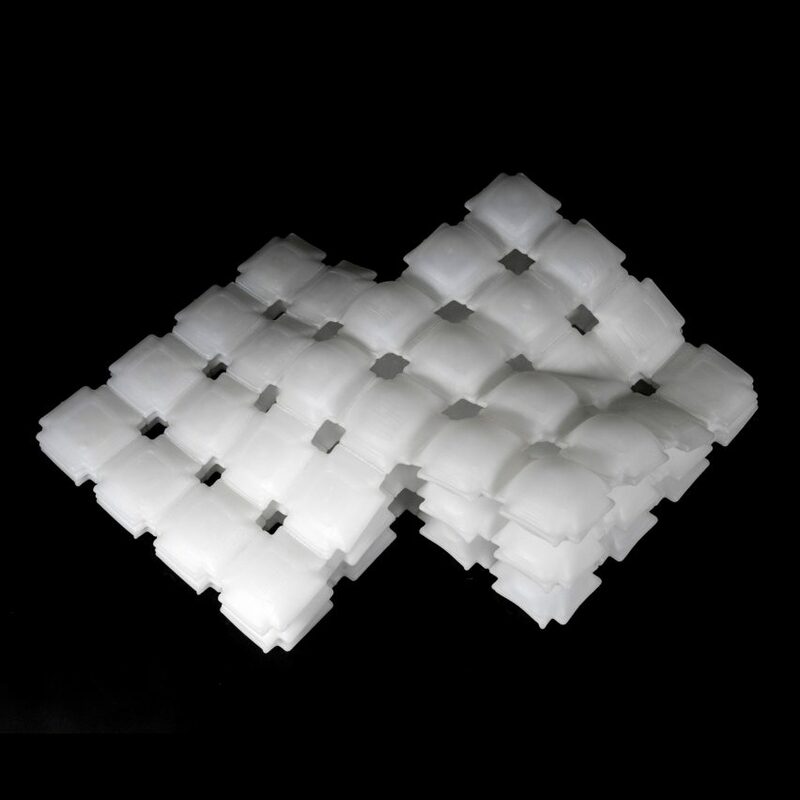 While Liquid Printed Pneumatics was developed with car interiors in mind, Tibbits sees possible applications for these customisable 3D-printed inflatables in furniture, shoes, packaging and soft robotics. Led by Tibbits and the Self-Assembly Lab of engineers and designers focuses on inventing new programmable materials and structures that assemble themselves. Besides Rapid Liquid Printing — which it demonstrated at last year’s Design Miami by printing tote bags for visitors — another of its recent innovations is an Active Auxetic material, which responds to different temperatures. 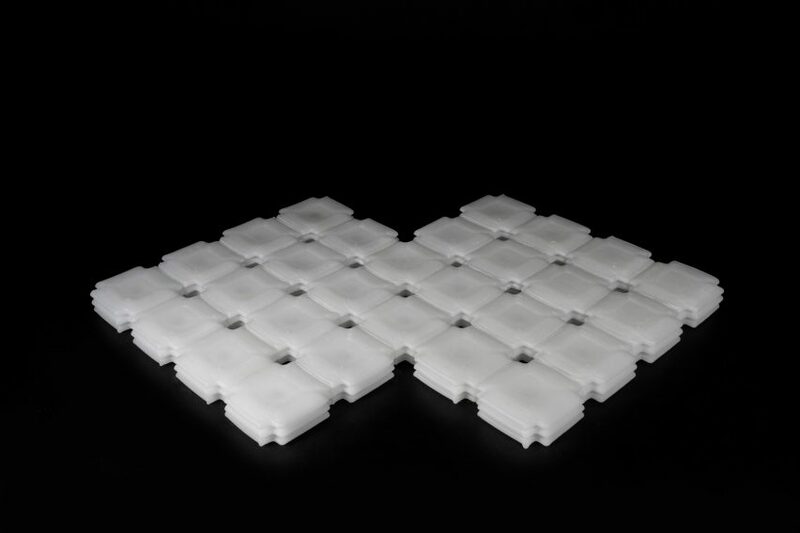 The Self-Assembly Lab has previously partnered with companies ranging from Airbus to Converse. While it has no immediate plans to use Liquid Printed Pneumatics, experiments with new materials provide BMW with the chance to radically rethink how cars look and interact with their passengers. Air and silicone aren’t currently major car components, but one day, they may be. The company explored some potential future design features in its influential 2016 concept car, the self-driving Vision Next 100, which had a retractable steering wheel, integrated windshield display and morphing exterior. At the concept car’s launch, BMW said the choice of materials would become “even more important throughout the design and production process” in the future, “allowing different vehicle shapes to emerge”. Liquid Printed Pneumatics is on display at London’s V&A museum as part of the exhibition The Future Starts Here until 4 November 2018. Be the first to comment on "MIT’s 3D-printed inflatables could shape the interiors of cars in the future"